It was a poem on a napkin that started it all. Just another Saturday night in LA, she went with her girlfriend to hear the singer, Don McLean, whose hit song, American Pie was climbing the charts. But it was when he sang the plaintive Empty Chairs that Lori Lieberman felt he was singing into her soul. Hence, began the genesis of Killing Me Softly. 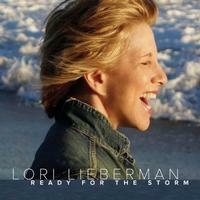 While she is best known for that classic song, Lori Lieberman has gone on to record 17 CDs. Her newest, “Ready For The Storm,” is mixed by the legendary Bob Clearmountain (Rolling Stones, Springsteen, David Bowie, etc.). “He really brought a balance to my music and brought my voice forward in a way I’d never have imagined”, says Lori. “I intentionally kept the orchestrations small and focused. While most of the songs are acoustically driven, some with only one guitar as in the classic, Last Thing On My Mind, some of the other songs are enhanced by electric guitar and I turned to Jason Orme for that, who plays with Alanis Morissette. He really brought these songs to life, with nods to Daniel Lanois and Mark Knopfler. Another, Alive In The World, by Jackson Browne, features just me on piano with cello. In the end, I found that putting less on, served the material more and gave it more heart and impact”.